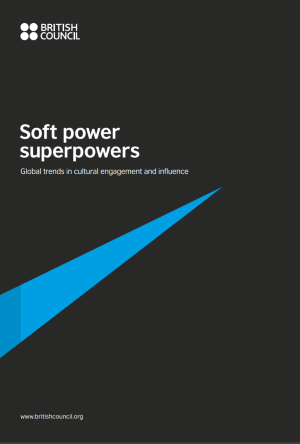 The British Council has launched a publication exploring ‘Soft Power’ entitled ‘Soft power superpowers Global trends in cultural engagement and influence’. There has been a huge expansion in soft power activity by nations in Asia over the past five years, according to a new report from the British Council. Soft Power Superpowers explores the soft power of eight leading G20 states. Alistair MacDonald, author of the report and British Council Senior Policy Analyst, highlights the key trends and lessons for the UK. Nations around the world are increasingly recognising the importance of soft power to the realisation of their global ambitions and investing heavily to increase their reach and impact, to tell their stories and shape the international agenda. Russia and China in particular have been massively expanding their investment in soft power activities such as international broadcasting and international cultural institutes and programmes. In Soft Power Superpowers the British Council explores some of the major global trends in soft power today. The report offers insight into how leading soft powers are seeking to grow their global influence. It offers new perspective on the challenges facing the UK’s leading status in an increasingly competitive ‘soft power marketplace’. For example, in the last five years alone China’s network of Confucius Institutes has grown from 320 to 507, making it by far the largest of the international cultural institutes. Russia too has been growing its cultural presence, with an increase of 209% in its cultural institutes, the Russkiy Mir Foundation. In contrast over the same period the networks of European countries’ cultural institutes have proven largely static or reduced. Today, networks are of ever more importance to the international success of states: influence flows through them, whether as digital megabytes or through real world, human connections. The educational and cultural networks that international cultural relations institutions represent are an essential element within that dynamic, complex web of connections. They are not the whole story, but they stand alongside states’ international broadcasting platforms – the BBC World Service, Deutsche Welle, NHK World, RT – as key ‘soft power assets’ representing a country overseas. The research has enabled the creation of a new interactive online tool that allows users to view the global networks of 12 nations’ leading international cultural organisations on an online heat map. This shows where the greatest concentrations of activity are – and the places that are being neglected. As the world’s leading international power, the United States has the greatest concentration of these institutions and appears to be the nation that is most targeted by others for cultural and education connections via the presence of their international cultural institutes. Interestingly, 80% of these 134 different offices in the USA are Chinese Confucius Institutes.